"S-400" redirects here. For other uses, see S400. The S-400 Triumf (Russian: C-400 Триумф, Triumph; NATO reporting name: SA-21 Growler), previously known as the S-300 PMU-3, is an anti-aircraft weapon system developed in the 1990s by Russia's Almaz Central Design Bureau as an upgrade of the S-300 family. It has been in service with the Russian Armed Forces since 2007. The S-400 uses four missiles to fill its performance envelope: the very-long-range 40N6 (400 km), the long-range 48N6 (250 km), the medium-range 9M96E2 (120 km) and the short-range 9M96E (40 km). The S-400 was described by The Economist in 2017 as "one of the best air-defence systems currently made". Development of the S-400 system began in the late 1980s, and the system was announced by the Russian Air Force in January 1993. On 12 February 1999 the first, reportedly-successful tests were performed at Kapustin Yar in Astrakhan, and the S-400 was scheduled for deployment by the Russian army in 2001. In 2003, it became apparent that the system was not ready for deployment. In August, two high-ranking military officials expressed concern that the S-400 was being tested with "obsolete" interceptors from the S-300P system and concluded that it was not ready for deployment. Completion of the project was announced in February 2004, and in April a ballistic missile was successfully intercepted in a test of the upgraded 48N6DM missile. In 2007, the system was approved for service. Russia has accepted for service the 40N6 long-range missile for the S-400 air defence system, a source in the domestic defense industry told TASS news agency in October 2018. S-400 Triumf and Pantsir missile system can be integrated into a two-layer defense system. The 30K6E is an administration system which manages eight divisions (battalions). The 55K6E is a command and control centre based on the Ural-532301. The 91N6E is a panoramic radar detection system (range 600 km) with protection against jamming which is mounted on an MZKT-7930. The S band system can track 300 targets. Six battalions of 98ZH6E surface-to-air missile systems (an independent combat system) can track no more than six targets on their own, with an additional two battalions if they are within a 40-kilometre (25 mi) range. The 92N6E (or 92N2E) is a multi-functional radar with a 400-kilometre (250 mi) range which can track 100 targets. The 5P85TE2 launcher and the 5P85SE2 on a trailer (up to 12 launchers) are used for launch. The 48N6E, 48N6E2, 48N6E3, 48N6DM, 9M96E, 9M96E2 and the ultra-long-range 40N6E are authorised by a Russian presidential decree. According to the Russian government, the S-400[specify] utilises an active electronically scanned array. Optional elements of the S-400 (98ZH6E) include the 15I6ME–98ZH6E, with coverage of 30, 60 and 90 km beyond the 30K6E coverage. The 96L6E has a 300-kilometre (190 mi) detection range. The 40B6M is housing for the 92N6E or 96L6E radar. The Protivnik-GE is an anti-stealth UHF radar with a 400-kilometre (250 mi) range. The Moscow-1 passive sensor is ​2 1⁄2 times more effective than the Protivnik, with a 400-kilometre (250 mi) range Orion for a target-designation on-the-air defence system, and the Avtobaza-M and Orion+ Avtobaza adds high-precision detection. The 1RL220BE versions were reportedly used for jamming. The 400-kilometre (250 mi)-range S-200D Dubna (SA-5c) missiles and S-300 P-family radar systems can be used without additional command-and-control centres. S-300 (SA-20A, SA-20B) missiles may also be guided. A-50 and A-50U aircraft provide early warning and command-and-control target designation. The 30К6Е control system can be integrated with the S-400 Triumph 98ZH6E system; the S-300PMU2 (through the 83М6Е2 control system); the S-300PMU1 (through the 83М6Е control system); the Tor-M1 through the Ranzhir-M battery-command post; the Pantsir-S1 through the lead battery vehicle. The Protivnik-GE and Gamma-DE radars, integrated with the 92H6E radar system, enables communication between each battery with Baikal-E senior command posts and similar types; nearby 30К6Е, 83М6Е and 83М6Е2 administration systems; the Polyana-D4М1 command post; fighter-aircraft command post, and mobile long-range radars. The system's VHF component provides sector search and tracking, with the X- and L-band components providing fine-tracking capability. Good placement of the radars relative to the threat axis enables the L- and X-band components to illuminate the incoming target from angles where the target RCS is sub-optimal. The RLM-S and RLM-D have better elevation-tracking accuracy than the RLM-M, and the Nebo M should be capable of producing high-quality tracks suitable for mid-course guidance of modern surface-to-air missiles and trajectory guidance of legacy SAMs. The Gamma-C1E SHF mobile radar station has a 300-kilometre (190 mi) detection range. The Nebo VHF mobile radar station and the Resonance-NE radar station have a detection range of 1,200 kilometres (750 mi) and 65 kilometres (40 mi) to a height of 500 metres (1,600 ft). All Nebo-family locators are doubled for army air defence. During the 1970s, the long-range mobile UHF 5H87 and SHF 5H69 low-altitude locators were used. a 1980s goal was detection at a height of 10 metres (33 ft) at a distance of 40 km (25 mi). The Elbrus-90 computer is used to control the system. For export to foreign customers, with the purpose of integrating existing customer air defence systems, additional work on improvement of the 30K6E administration system for information technology pairing with anti-kets is in progress. 96L6E radar and equipment work separately (100 metres), 96L6E2 export version has the capability to track a maximum 100 targets. In mountainous terrain the system is resistant to false returns or clutter. Replaces the radar to detect low-level radar targets and conduct radar sector review. Omnidirectional to detect all aircraft types, including low-observable (not against ballistic missiles). Can perform the functions of a command post for battalions of S-300 (SA20/20A/20B) or S-400. 96L6-1 of S-400 and S-500. Maximum height for the detection of the target 100 km away and from all directions. Can use a special tower 966AA14. Detection capability against cruise missiles and stealth. It serves as the command post for the battalions. Phased-array radar and multipath. 5P85TE2 launchers and/or 5P85SE2 on the trailer in conjunction with a BAZ-64022 or MAZ-543M tractor-trailer. In 2014, a new type of transporter was introduced, improving the mobility of the system. The fuel consumption was cut by 35%. The total cost of launcher actually dropped 25% (The cost of transporters in 2014 is 8.7 million rubles [approximately 240 thousand dollars]). One system comprising up to 8 divisions (battalions) can control up to 72 launchers, with a maximum of 384 missiles (including missiles with a range of less than 250 km (160 mi)). The missiles are fired by a gas system from the launch tubes up to 30 metres into the air before the rocket motor ignites, which increases the maximum and decreases the minimum ranges. In April 2015, a successful test firing of the missile was conducted at an airborne target at a range of 400 km (250 mi); TELs carrying the long-range 40N6 may only be able to hold two missiles instead of the typical four due to its larger size. Another test recorded a 9M96 missile using an active radar homing head, reached a height of 56 km. All the missiles are equipped with directed explosion warhead, which increases the probability of complete destruction of targets. In 2016, Russian anti-aircraft missile troops received new guided missiles for S-300 and S-400 defense systems. Anti-aircraft missile system, designed to destroy aircraft, cruise and ballistic missiles, it can also be used against ground objectives. The S-400 is able to intercept cruise missiles out to a range of about 40 km due to their low altitude flight paths. active radar homing With an active radar homing head, climbs to designated altitude then guidance switches to search & destroy mode. Effective against low-altitude targets at extremely long range (below the radio horizon). 9M96E2 120 km (75 mi) 30 km (98,000 ft) 1,000 m/s (2,200 mph; Mach 2.9) (1M=295–340 m/s → 1000 m/s≈3~3.3M) 420 kg (930 lb) 24 kg (53 lb) Active radar homing High hit probability with one missile against fast, maneuvering targets. Aircraft = 0.9; UAV = 0.8; Missile = 0.7. Load factor of more than 20 g at 30 km altitude greatly increases the probability to destroy short- to medium-range ballistic missiles. 9M96E 40 km (25 mi) 20 km (66,000 ft) 900 m/s (2,000 mph; Mach 2.6) 333 kg (734 lb) 24 kg (53 lb) Active radar homing Marksmanship for the radio horizon, with homing action to aid interception of low-flying targets at long range. Optical and infrared range of 9M96 versions combined with approximate figures from long-wavelength radar can detect and home-in on stealth targets. The ABM capabilities of the S-400 system are near the maximum allowed under the (now void) Anti-Ballistic Missile Treaty. A separate independent air defence system 42S6 Morfey (Morpheus) is being developed. This system is designated as short-range air defence system to protect the S-400 from various threats at their terminal phases, and will also act together with the S-350E as a supplement to the S-400. Together, these systems form part of the Aerospace Defence Forces. Exterior target indication separate independent RLS "Niobium". Mobility 5 minutes. Frequency band S and UHF. Detection range of 600 km (RCS 1 square meter to 430 km), the target speed of 8000 km / h, 4791 miles, Mach 6.35. For detection, the owner of the state to transfer command of targeting items (in this application, the maximum speed grows from subordinates systems). Planner "nniirt". All-purpose maximum radial velocity is 4.8 kilometres per second (17,000 km/h; 11,000 mph; Mach 14); absolute limit 5 kilometres per second (18,000 km/h; 11,000 mph; Mach 15), the minimum is zero. System response time 9–10 seconds. The complex can move on roads (60 km/h) and off-road (ground) at speeds up to 25 km/h. According to the Pravda.ru newspaper article, the price of one battalion (about 7–8 launchers) is $200 million. Practical probability of success 83.3% (for 1 missile, not 2). One day overcome 1500 km (railway transport), occupied position. Destroyed 10 targets, applied 12 missiles. Targets were at extra high and super low height. In conditions of strong interference, and at the maximum range (250 km), a small-sized target (China) was destroyed, the target speed was 3 km / s (ballistic missile). On August 6, 2007, the first regiment equipped with S-400 entered active service in Moscow Oblast near Elektrostal, according to Channel One Russia. This is the 606th Guards Anti-air Rocket Regiment, 9th PVO Division, 1st PVO Corps, of the Special Purpose Command. On February 8, 2008, Lt. Gen. Vladimir Sviridov announced that Russia will be replacing the S-300 systems in the Northwest of Russia with the more technologically advanced S-400. Russian military experts expect that Russia plans for this system to be in place and represent a major component of their ballistic missile defense system until 2020. In September 2006, Deputy Prime Minister Sergei Ivanov announced a new state program of armaments for 2007–15. This program provides for the purchase of 18 missile battalions of S-400s. On March 17, 2009, Russia's defense minister announced that a second regiment equipped with advanced S-400 Triumf air defense missile systems has been put into combat service. On August 26, 2009, the General Staff said S-400 systems had been deployed in the Russian Far East to counter possible North Korean missile tests and prevent fragments from falling on Russian territory. In February 2011, a second unit of S-400 missile systems was deployed at Dubrovki, north of Moscow. The 210th Air Defence Regiment consists of two battalions, each consisting of eight launch points, each with four missiles. In February 2011, it was also announced that the missile system will be deployed in southern Kuril Islands "to protect Russia's sovereignty in the Far East". The Baltic Fleet in Kaliningrad received S-400 SAM systems in February 2012, and these went into operational status in April 2012. One S-400 division is deployed on combat duty in the Russian far east city Nakhodka. As of 2012, one system (in Electrostal) was operational, with three more S-400 battalions being deployed. All 56 battalions will be delivered by 2020. Russia is also setting up two regiments of S-400 in Eastern Military district. As of September 2013, the Russian Armed Forces had five S-400 regiments: two in Moscow, one in the Pacific fleet, one in the Baltic Fleet, and one in the Southern Military District. From 2014, the army was to receive two to three sets of regimental units of S-400 systems every year. Another S-400 regiment was to be put on combat duty around Moscow by the end of 2013. Russia plans to have 28 S-400 regiments by 2020, each comprising two or three battalions with four systems each, mainly in maritime and border areas. In November 2015, it was announced that when the Kirov-class battlecruiser Admiral Nakhimov was recommissioned with the Russian Navy in 2018, it will be equipped with the 48N6DMK anti-aircraft missile derived from the land-based S-400. The inclusion of the 48N6DMK into the Kirov's arsenal extends its air defense range from 100 km (62 mi; 54 nmi) with the 48N6E2 missile from the S-300FM to 250 km (160 mi; 130 nmi). On 1 March 2016, the acting commander of the 14th Air Force and Air Defense Army, major general Vladimir Korytkov, said that six S-400 units had been activated pursuant to his order in the anti-aircraft missile regiment of the Novosibirsk air defense formation in Russia's Novosibirsk Oblast. TASS also reported that as of the end of 2015, a total of eleven Russian missile regiments were armed with S-400, and by the end of 2016 their number was expected increase to sixteen. In November 2015, the deployment of S-400 was reported in Syria, along with the contingent of Russian troops and other military hardware in the course of the air campaign conducted by the Russian forces on the side of the Syrian government. However, those reports were refuted by Russia. On 25 November 2015, the Russian government announced it would deploy S-400s in Syria in response of the downing of its SU-24 jet by Turkey. On 26 November 2015, such deployment was reported by official Russian news media to have been carried out. 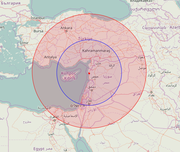 The first S-400 system was reportedly installed at Humaymim Air Base in Latakia Governorate. Between April and July 2017, a second S-400 system was deployed 13 km northwest of Masyaf, Hama Governorate. In March 2014, it was announced that Russian President Vladimir Putin gave authorization to sell the S-400 system to the People's Republic of China. If China should acquire the S-400, reported to initially consist of six batteries, it would significantly improve China's ability to defend its own air space and serve as an effective stand-off weapon against air attacks. With a 400 km (250 mi) coverage range, aircraft in disputed areas off the coast could be targeted by SAMs from the mainland; all of Taiwan would be covered from Fujian province, and the Diaoyu Islands would be covered from Shandong province, making it difficult for the US and Japan to deploy combat aircraft over those airspaces. Taiwan seeks to address these potential advantages by locating S-400 batteries once activated using extensive SIGINT units and destroying them with stand-off weapons, cruise and ballistic missiles, and anti-radiation missiles. On 13 April 2015, the chief executive of the Russian state-run arms trader Rosoboronexport has confirmed that China secured a contract with his company for the purchase of the S-400 air defence systems. Although China's acquisition of the S-400 system has been viewed as a "game changer" in the region, several factors may constrain its effectiveness in East Asia. Though the 40N6 missile has a range of 400 km, it is not known if such a missile is available for export. Even if China does acquire the missile, the disputed Diaoyu Islands would be at the limit of its range if stationed along the coast, as would the Indian capital New Delhi if stationed right on the border and moved into the Himalaya Mountains. Against Taiwan, only the 40N6 could bring all its airspace in range, but deploying it along the coast of Fujian province at sea level would prevent it from locating low-level aircraft at long range due to the Earth's curvature; the shorter-range 48N6 would be even less useful against maneuvering targets at long range. These issues, along with dangers of misidentifying and engaging friendly aircraft at such great distances, may restrict Chinese S-400 use to mainly defensive purposes. Delivery of the system began in January 2018. It was reported that China planned to test fire Russian S-400 systems for the first time in late July or early August 2018. During the 2009 International Defence Industry Fair in Istanbul, interest was expressed by Turkey in buying the system. In late 2017, the president of Turkey and Russian officials have signed an agreement for a guaranteed delivery of 2.5 billion US$ worth of S-400 unit delivery More recently, the US Secretary of State, Mike Pompeo, raised concerns over Turkey's S-400 deal with Russia, but Turkish officials rejected the US threat of sanctions over its purchase of S-400 missile systems citing existing international protocols and agreement forms mutually signed and agreed by Turkey and Russia. Vice Chairman of Russia's State Duma Vladimir Zhirinovsky has urged the fast delivery of the S-400 anti-aircraft missile systems to Iran. On 24 August 2009, RIA Novosti reported that their sources indicated that Belarus had submitted a formal request for two battalions of S-400 systems. In September 2009, it was reported that the S-400 system is part of a $US2 billion arms deal being negotiated between Russia and Saudi Arabia. As of March 2010, this was still under negotiation. The Saudis want to buy twelve systems, each of eight launchers. The Saudis were trying to buy the more modern S-400, but the Russians reportedly only wanted to sell the older S-300. South Korea is developing a simplified medium range SAM system, M-SAM Cheolmae-2, based on technology from the 9M96 missile and with the help of Almaz (Russian). The prime contractor is Samsung Thales, a joint venture between Samsung and Thales (French). The M-SAM will be composed of an X band multi-function radar vehicle built by Samsung Thales in technical cooperation with Almaz, and fire-control vehicles and transporter erector launchers built by Doosan. LIG Nex1 will provide the missiles. In February 2017, Sergey Chemezov, CEO of Rostec Corporation, stated that Egypt was interested in the S-400 system. He explained that Russia offered Egypt to purchase either additional Antey-2500 systems or the S-400 system which was much more expensive. Chemezov noted that Cairo had financial issues which delayed the negotiations. Sergey Chemezov stated that Russia is willing to sell S-400 to any state buyer, including the U.S.
On 15 October 2016 during the BRICS Summit, India and Russia signed an Inter-governmental Agreement (IGA) for the supply of five S-400 anti-aircraft missile systems. On 5 October 2018, India and Russia signed a US$5.43 billion (₹40,000CR) deal for five S-400 missile systems. The deliveries are expected to commence in 24 months, by the end of 2020. The S-400 is expected to be inducted into Indian service in October 2020. In February 2018, the Iraqi Minister of Foreign Affairs Ibrahim al-Jaafari confirmed ongoing rumors that it had shown interest in the S-400 and that negotiations with Russia were underway. In January 2018, Russian state media TASS reported that Qatar was in an advanced state of talks to procure S-400 missile systems. 2 battalions of the 1533th Anti-Aircraft Rocket Regiment in the Eastern Military District, Vladivostok. 2 battalions of the 18th Anti-Aircraft Rocket Regiment in the Southern Military District, Feodossia, Crimea. 2 battalions in 1528th Anti-Aircraft Regiment, Arkhangelsk region, Western Military District. Belarus – announced their intentions to purchase the S-400 in September 2011. Deliveries will start in 2015 (official statement). 2 systems in 2016. People's Republic of China - Deliveries of units have begun in January 2018, and are being inducted. Algeria – Algeria has begun deploying Russian S-400 SAM systems. including Redick complex, for complete system maintenance. India - Contract signed in October 2018 during an official meeting between Russia's President Vladimir Putin and India's Prime Minister Narendra Modi in New Delhi. Deal worth of $5.43 billion includes delivery of 5 regiments of the S-400 air defence system for the Indian Air Force by 2020. Saudi Arabia – Contract signed in October 2017 during official visit of Saudi King Salman I to Moscow. Deal worth more than $3 billion also includes ground equipment for Royal Saudi Land Forces. Turkey – Contract signed in 2017. President Recep Tayyip Erdoğan confirmed that deposit had been paid. The deal is thought to be worth $2.5 billion. Turkish Under secretary for Defence Industries Ismail Demir said the S-400 delivery is brought forward to July 2019. ^ "ЗРС С-400 Триумф" [S-400 Triumf] (in Russian). S400.ru. Archived from the original on 2001-10-31. Retrieved 2013-10-29. ^ "Game Changer: China Will Soon Have S-400 Air Defense Systems Defending Its Skies". Retrieved 6 February 2018. ^ Bryen, Stephen (17 October 2017). "Russia's S-400 Is a Game Changer in the Middle East (and America Should Worry)". ^ "Turkey and Russia cosy up over missiles". The Economist. 4 May 2017. Retrieved 7 May 2017. ^ Land Based Air Defence, Jane's, 2010–2011 . ^ a b "S-400 (SA-20)". Missile Threat. CSIS. ^ "Russia: New S-400 Air Defense System Coming Soon". Periscope Daily Defense News Capsules. April 4, 2001. ^ "Russia Trumpets New S-400 Missile System". BBC Monitoring. March 23, 2001. ^ "-400". VPK. Retrieved 14 November 2014. ^ "Advanced long-range missile for S-400 system accepted for service in Russia". Tass. ^ "Russia's newest anti-air defenses are in Syria — and the US should be worried". Business insider. ^ "The S-400–Pantsir 'Tandem': The New-Old Feature of Russian A2/AD Capabilities". Jamestown. ^ a b c "Зенитный ракетный комплекс С-400 'Триумф'" [Anti-aircraft missile system S-400 'triumph'] (in Russian). Retrieved 14 November 2014. ^ "Характеристики зенитной ракетной системы С-400 "Триумф"" [Characteristics of surface-to-air missile systems s-400 "triumph"]. RIA Novosty (in Russian). Retrieved 14 November 2014. ^ "-400 "" (, )". -. Retrieved 14 November 2014. ^ a b "Зенитный ракетный комплекс С-400 'Триумф'". new-factoria.ru. ^ "С-400 сбивает любой "стелс"". topwar.ru. ^ a b c d e f g h "ГСКБ Концерна ПВО Алмаз-Антей имени академика А.А. Расплетина (ОАО НИЭМИ) : с-25 беркут, бункин борис васильевич, с 300 пму, с-300 пму, зрс, с-400 триумф, средства пво, четырёхсотка, противовоздушная оборона". Archived from the original on 3 April 2014. Retrieved 14 November 2014. ^ "Западные СМИ: зенитно-ракетные комплексы S-400 и S-500 могут стать лучшими комплексами противовоздушной обороны в мире". Retrieved 14 November 2014. ^ "ГСКБ Концерна ПВО Алмаз-Антей имени академика А.А. Расплетина". Archived from the original on 29 November 2014. Retrieved 14 November 2014. ^ Частокол противовоздушной обороны / Вооружения / Независимая газета (in Russian). Nvo.ng.ru. 29 February 2008. Retrieved 29 October 2013. ^ "Пять преимуществ С-400 над Patriot". Российская газета. ^ a b c Мобильная многоканальная зенитная ракетная система С-400 "Триумф" [Mobile multichannel air defense missile system S-400 "Triumf"] (in Russian). Archived from the original on 2014-01-02. Retrieved 2014-08-30. ^ "АО НПО ЛЭМЗ – ПРОДУКТЫ и УСЛУГИ – УПРАВЛЕНИЕ ВОЗДУШНЫМ ДВИЖЕНИЕМ". lemz.ru. ^ "Армия получит комплекс радиолокации "Москва-1"". rostec.ru. ^ "RusArmy.com –". Retrieved 14 November 2014. ^ "1Л222 Автобаза". Retrieved 14 November 2014. ^ "Индексы ГРАУ МО СССР / РФ". Archived from the original on 2 January 2014. Retrieved 14 November 2014. ^ "Россия представит уникальные военные разработки". Retrieved 14 November 2014. ^ a b "-400". Retrieved 14 November 2014. ^ a b c "Зенитная ракетная система С-400 "Триумф"". Retrieved 14 November 2014. ^ "ТАНТК им. Г. М. Бериева – самолёт радиолокационного дозора и наведения А-50Э". beriev.com. ^ "Russian / PLA Low Band Surveillance Radars". Archived from the original on 2 March 2017. ^ "RusArmy.com - Радиолокационная станция "Гамма-C1E"". www.rusarmy.com. ^ bmpd (21 April 2016). "Закупка радиолокационных станций "Ниобий-СВ"". ^ Sudakov, Dmitry (September 25, 2017). "Russia's S-400 air defence systems for NATO armies". Pravda Report. The S-400 works equally well in 360 degrees of activity area. Its phased array radar antenna with Elbrus-90 computer ensures the detection range of up to 600 kilometres. ^ a b "НЕВСКИЙ БАСТИОН, ВОЕННО-ТЕХНИЧЕСКИЙ СБОРНИК, ВООРУЖЕНИЯ, ВОЕННАЯ ТЕХНИКА, ВОЕННО-ТЕХНИЧЕСКИЙ СБОРНИК, СОВРЕМЕННОЕ СОСТОЯНИЕ, ИСТОРИЯ РАЗВИТИЯ ОПК, БАСТИОН ВТС, НЕВСКИЙ БАСТИОН, ЖУРНАЛ, СБОРНИК, ВПК, АРМИИ, ВЫСТАВКИ, САЛОНЫ, ВОЕННО-ТЕХНИЧЕСКИЕ, НОВОСТИ, ПОСЛЕДНИЕ НОВОСТИ, ВОЕННЫЕ НОВОСТИ, СОБЫТИЯ ФАКТЫ ВПК, НОВОСТИ ОПК, ОБОРОННАЯ ПРОМЫШЛЕННОСТЬ, МИНИСТРЕСТВО ОБОРОНЫ, СИЛОВЫХ СТРУКТУР, КРАСНАЯ АРМИЯ, СОВЕТСКАЯ АРМИЯ, РУССКАЯ АРМИЯ, ЗАРУБЕЖНЫЕ ВОЕННЫЕ НОВОСТИ, ВиВТ, ПВН" [Nevsky Bastion, The Military Technical Collection, Weapons, Military Equipment, Military Technical Collection, State Of The Art, The History Of The Development Of The Defense Industrial Complex, The Bastion Of The PTS, Nevsky Bastion, Magazine Sampler, Mic, Army, Exhibitions, Showrooms, Military-Technical, News, Latest News, Military News, Events, Facts Of The MIC, Mic News Defense Industry, Ministry Of Defence, The Security Forces, The Red Army, The Soviet Army, Russian Army, Foreign Military News, A And Me, HRP]. nevskii-bastion.ru (in Russian). ^ "С-400 vs Patriot: в чем американцы уступают нашим ЗРС". 28 April 2015. ^ "РАДИОЛОКАЦИОННАЯ СТАНЦИЯ 96Л6Е" [96L6E RADAR]. guns.ru (in Russian). ^ "ОРУЖИЕ ОТЕЧЕСТВА, ОТЕЧЕСТВЕННОЕ ОРУЖИЕ И ВОЕННАЯ ТЕХНИКА (ОВТ)ВООРУЖЕНИЯ, ВОЕННАЯ ТЕХНИКА, ВОЕННО-ТЕХНИЧЕСКИЙ СБОРНИК, СОВРЕМЕННОЕ СОСТОЯНИЕ, ИСТОРИЯ РАЗВИТИЯ ОПК, БАСТИОН ВТС, НЕВСКИЙ БАСТИОН, ЖУРНАЛ, СБОРНИК, ВПК, АРМИИ, ВЫСТАВКИ, САЛОНЫ, ВОЕННО-ТЕХНИЧЕСКИЕ, НОВОСТИ, ПОСЛЕДНИЕ НОВОСТИ, ВОЕННЫЕ НОВОСТИ, СОБЫТИЯ ФАКТЫ ВПК, НОВОСТИ ОПК, ОБОРОННАЯ ПРОМЫШЛЕННОСТЬ, МИНИСТРЕСТВО ОБОРОНЫ, СИЛОВЫХ СТРУКТУР, КРАСНАЯ АРМИЯ, СОВЕТСКАЯ АРМИЯ, РУССКАЯ АРМИЯ, ЗАРУБЕЖНЫЕ ВОЕННЫЕ НОВОСТИ, ВиВТ, ПВН" [Weapons Of The Fatherland, Our Arms And Military Equipment (OVT) Weapons, Military Equipment, Military Technical Collection, State Of The Art, The History Of The Development Of The Defense Industrial Complex, The Bastion Of The PTS, Nevsky Bastion, Magazine Sampler, Mic, Army, Exhibitions, Showrooms, Military-Technical, News, Latest News, Military News, Events, Facts Of The MIC, Mic News Defense Industry, Ministry Of Defence, The Security Forces, The Red Army, The Soviet Army, Russian Army, Foreign Military News, A And Me, HRP]. bastion-opk.ru (in Russian). ^ a b "Масштабные учения со стрельбами из С-300 и С-400 пройдут под Астраханью" [Extensive exercises with the firing of S-300 and S-400 will be Astrakhan]. arms-expo.ru (in Russian). ^ "ЗРС С-500 начнут поступать в войска в 2016" [S-500 will come to troops in 2016]. arms-expo.ru (in Russian). ^ "ЗРС С-400 "Триумф": обнаружение – дальнее, сопровождение – точное, пуск – поражающий – Журнал "Воздушно-космическая оборона"" [S-400 "triumph": Discovery-far, escorts-fine, start-striking-magazine "air-space defense"]. vko.ru (in Russian). ^ "Ростех :: Новости :: "Авиационное оборудование" модернизировало транспортную машину для С-400" [Rustech: News: aviation equipment "modernized transport car for S-400]. rostec.ru (in Russian). 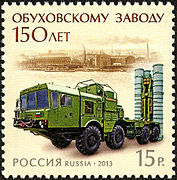 ^ "Missiles sol-air S-400 (Triumph)". RIA Novosti (in French). Retrieved 14 November 2014. ^ a b c d "ЗРС С-400 "Триумф"". Retrieved 14 November 2014. ^ a b c "Характеристики зенитной ракетной системы С-400". РИА Новости. Retrieved 14 November 2014. ^ "Минобороны России испытало новую ракету для ЗРС С-400". РИА Новости. ^ "ТАСС: Армия и ОПК – Минобороны испытало дальнюю ракету для С-400". ТАСС. ^ "До конца года в армии появится еще один полк С-400". Retrieved 14 November 2014. ^ "SA-21 GROWLER (S-400)". Scribd. ^ "Применение ЗРС С-400 Триумф". s400.ru. Archived from the original on 2013-11-26. ^ "Russian Aerospace Force receives over 30 planes and helicopters in 2016". ^ "Russian troops in Crimea receive S-400 antiaircraft missile system". ^ a b c d "Характеристики зенитной управляемой ракеты большой дальности 40Н6". livejournal.com. Retrieved 2018-08-24. ^ a b сборник, БАСТИОН: военно-технический. "НЕВСКИЙ БАСТИОН, ВОЕННО-ТЕХНИЧЕСКИЙ СБОРНИК, ВООРУЖЕНИЯ, ВОЕННАЯ ТЕХНИКА, ВОЕННО-ТЕХНИЧЕСКИЙ СБОРНИК, СОВРЕМЕННОЕ СОСТОЯНИЕ, ИСТОРИЯ РАЗВИТИЯ ОПК, БАСТИОН ВТС, НЕВСКИЙ БАСТИОН, ЖУРНАЛ, СБОРНИК, ВПК, АРМИИ, ВЫСТАВКИ, САЛОНЫ, ВОЕННО-ТЕХНИЧЕСКИЕ, НОВОСТИ, ПОСЛЕДНИЕ НОВОСТИ, ВОЕННЫЕ НОВОСТИ, СОБЫТИЯ ФАКТЫ ВПК, НОВОСТИ ОПК, ОБОРОННАЯ ПРОМЫШЛЕННОСТЬ, МИНИСТРЕСТВО ОБОРОНЫ, СИЛОВЫХ СТРУКТУР, КРАСНАЯ АРМИЯ, СОВЕТСКАЯ АРМИЯ, РУССКАЯ АРМИЯ, ЗАРУБЕЖНЫЕ ВОЕННЫЕ НОВОСТИ, ВиВТ, ПВН". nevskii-bastion.ru. Retrieved 2017-02-06. ^ a b c d e f g h i j "S-400 Triumf AusAirpower". AusAirpower.com. Retrieved 11 January 2016. ^ a b c d e f g h Dr C Kopp. "S-400 Triumf AusAirpower". AusAirpower.com. Retrieved 14 November 2014. ^ a b c d e f "С-400 "Триумф", зенитная ракетная система" [S-400 "Triumph" surface-to-air missile system]. Arms Expo (in Russian). Archived from the original on 23 March 2011. ^ "Зенитный ракетный комплекс ПВО средней дальности С-350 50Р6А "Витязь"". Retrieved 28 May 2016. ^ a b "Пять преимуществ С-400 над Patriot". 5 May 2014. ^ Andrei Kislyakov, specially for RIR (2012-12-18). "Russia to roll out new hypersonic missiles". Indrus.in. Retrieved 2013-10-29. ^ "S-500 Prometheus". MissileThreat.com. April 26, 2013. Retrieved 2013-10-29. ^ a b c "Национальная оборона / Оборонно-промышленный комплекс / В интересах ВКО России". oborona.ru. 2 October 2013. ^ Редактор. "В России создаётся новый ЗРК "Морфей"". army-news.ru. ^ "НОВЫЙ ЗРК "МОРФЕЙ"". narod.ru. ^ Sputnik (24 April 2013). "Russia to Get New Short-Range Air Defense System in 2015". sputniknews.com. ^ ""Морфей" опаздывает на два года". vpk-news.ru. ^ "Россия получит мощный воздушный щит с новым ЗРК "Морфей"". topwar.ru. ^ "42С6 "Морфей" – зенитный ракетный комплекс ближнего действия". army.lv. ^ сборник, БАСТИОН: военно-технический. "ВООРУЖЕНИЯ, ВОЕННАЯ ТЕХНИКА, ВОЕННО-ТЕХНИЧЕСКИЙ СБОРНИК, СОВРЕМЕННОЕ СОСТОЯНИЕ, ИСТОРИЯ РАЗВИТИЯ ОПК, БАСТИОН ВТС, НЕВСКИЙ БАСТИОН, ЖУРНАЛ, СБОРНИК, ВПК, АРМИИ, ВЫСТАВКИ, САЛОНЫ, ВОЕННО-ТЕХНИЧЕСКИЕ, НОВОСТИ, ПОСЛЕДНИЕ НОВОСТИ, ВОЕННЫЕ НОВОСТИ, СОБЫТИЯ ФАКТЫ ВПК, НОВОСТИ ОПК, ОБОРОННАЯ ПРОМЫШЛЕННОСТЬ, МИНИСТРЕСТВО ОБОРОНЫ, СИЛОВЫХ СТРУКТУР, КРАСНАЯ АРМИЯ, СОВЕТСКАЯ АРМИЯ, РУССКАЯ АРМИЯ, ЗАРУБЕЖНЫЕ ВОЕННЫЕ НОВОСТИ, ВиВТ, ПВН, информация по военной технике, сайт по Военной технике". bastion-karpenko.ru. ^ "ЗРС "Триумф" – ОАО "НПО "Алмаз"". Archived from the original on 3 July 2015. Retrieved 14 November 2014. ^ "С-400 сумел поразить гиперзвуковые и баллистические цели". lenta.ru. ^ "Противоракетная защита Москвы пополнится пятым по счету полком С-400". Российская газета. ^ "ЗЕНИТНАЯ РАКЕТНАЯ СИСТЕМА С-400 "ТРИУМФ", ANTIAIRCRAFT MISSILE SYSTEM S-400 "TRIUMPH"". narod.ru. ^ a b "Зенитная ракетная система большой и средней дальности С-400 "Триумф"". vpk.name. ^ a b "С-400 и С-500 в программе "Военная Тайна"". YouTube. Retrieved 14 November 2014. ^ a b "Ракету дальнего радиуса действия для С-400 создадут в 2012 году". Retrieved 14 November 2014. ^ "Ракеты для С-400 поставят на поток в третьем квартале 2010 года". РИА Новости. ^ "RusArmy.com – Зенитная ракетная система большой и средней дальности С-400 "Триумф"". rusarmy.com. ^ "S-400令土耳其疏遠北約 普京乘虛而入". 13 September 2017 – via www.bbc.com. ^ "Зенитная ракетная система С-400 "Триумф" в деталях". Военно-патриотический сайт «Отвага». Retrieved 14 November 2014. ^ "Характеристики С-400 "Триумф"". 18 September 2015. ^ "Ошибка – нет ни одного сайта". raspletin.ru. Archived from the original on 30 October 2013. ^ Defense Update. "After 3 years Delay, S-400 Triumf is Officially Fielded". Archived from the original on 16 October 2014. Retrieved 14 November 2014. ^ "Характеристики С-400 "Триумф"". РИА Новости (in Russian). Retrieved 2017-02-06. ^ "- .name". Retrieved 14 November 2014. ^ "S-500 Prometheus". Missile Threat. Retrieved 14 November 2014. ^ "С-400 против MEADS" [S-400 against MEADS]. Правда.Ру (in Russian). Retrieved 14 November 2014. ^ "Одновременный пуск 12 ракет С-400 сняли на видео". 27 February 2017. ^ a b tvzvezda.ru, Редакция. "Корреспондент "Звезды" сняла одновременный пуск 12 ракет С-400". ^ a b Denisov, Anton (August 26, 2008). "Russia deploys S-400 air defense systems in Far East". RIA Novosti. Retrieved December 9, 2010. A regular S-400 battalion comprises at least eight launchers with 32 missiles and a mobile command post. ^ "S-400 missile defense systems to start defending Moscow July 1". RIA Novosti. May 21, 2007. Retrieved December 9, 2010. ^ "Systém S-400 připraven k obraně Moskvy" [The S-400 is ready to defend Moscow]. ATM online (in Czech). CS: RIA Novosti. May 31, 2007. Archived from the original on July 3, 2007. Retrieved December 9, 2010. …S-400 will be given to full combat readiness to defend Moscow and central Russia (near the town of Elektrostal in the Moscow region) on 1 July 2007. ^ "Russia moves to longer-range interceptors". United Press International. 8 February 2008. Archived from the original on 12 February 2008. Retrieved 9 December 2010. Russian military experts expect the S-400 to be the backbone of the country's missile defenses through at least 2020. ^ "Second S-400 air defense regiment put into service in Russia". RIA Novosti. March 17, 2009. Retrieved December 10, 2010. ^ "Defense Russia's second S-400 missile unit enters service", Rian, 16 February 2011 . ^ "Russia to deploy modern missile defense systems on disputed Kuril Islands", Rian, 15 February 2011 . ^ "Baltic Fleet Receives S-400 Air Defense Missile Systems". Rus navy. 2012-04-06. Retrieved 2013-10-29. ^ "Балтийский флот заменит ЗРК С-200 на "Триумфы"" [The Baltic fleet will replace the S-200 with the "Triumf"], Lenta (in Russian), 11 December 2011 . ^ a b "SA-21 Growler/S400 Triumph Long Range TABM/SAM – Russian Military Analysis". be: Warfare. Retrieved 2013-10-29. 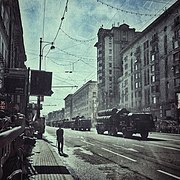 ^ "Russia to induct three S-400 battalions in 2012". Air Force Technology. 19 March 2012. Retrieved 6 April 2012. ^ "Russia's Eastern Military District Gets S-400 Missiles". Rian. 2012-06-09. Retrieved 2013-10-29. ^ "Russian army will receive two or three new regiments of S-400 defense missile systems every year", Armyrecognition, 15 September 2013 . ^ "New regiment of S-400 air defense missile system will enter in service with the Russian army", Army recognition, 8 October 2013 . ^ "Russia's Kirov Class Cruiser Admiral Nakhimov to be Fitted with 48N6DMK Missiles From S-400", Navy recognition, 12 November 2015 . ^ a b "S-400 Triumph missile systems put on combat duty in Siberia". TASS. 1 March 2016. Retrieved 1 March 2016. ^ Россия разместила в Сирии новейшие системы ПВО С-400 "Триумф", утверждает пресса NEWSru, 13 Nov 2015. ^ Missing Russian jet pilot 'alive and well' in Syria Retrieved 25 November 2015. ^ "Россия развернула в Сирии ЗРК С-400". Kommersant. November 26, 2015. Retrieved November 26, 2015. ^ a b Binnie, Jeremy; O'Connor, Sean (September 29, 2017). "Second Russian S-400 in Syria confirmed". Jane's Information Group. Archived from the original on October 2, 2017. Retrieved October 1, 2017. ^ Administrator. "Russia gives green light to sell S-400 air defense missile systems to China 3103144 – March 2014 Global Defense Security news UK – Defense Security Global news Industry army 2014". armyrecognition.com. ^ Sputnik (13 April 2015). "Russia Confirms Arms Deal to Supply China With S-400 Air Defense Systems". sputniknews.com. ^ "Китай закупил у России зенитную ракетную систему С-400" [China has purchased Russian anti-aircraft missile system S-400]. NTV.ru (in Russian). 13 April 2015. Retrieved 26 November 2015. ^ Dominguez, Gabriel (January 18, 2018). "Russia begins delivering S-400 air defence systems to China, says report". Jane's Information Group. Russia has begun delivering the Almaz-Antei S-400 Triumf self-propelled surface-to-air missile (SAM) system to China under the terms of a contract signed in 2014, TASS news agency cited an unnamed source close to the Russian military-industrial complex as saying on 18 January. ^ "China to test fire Russian S-400 systems for first time in late July-early August — source". TASS. July 27, 2018. China plans to carry out the first-time test firing of Russia’s S-400 Triumf missile defense systems in the end of July or in early August, a military and diplomatic source told TASS. ^ "Turkey hopes to buy S-400 air defense systems from Russia". RIA Novosti. April 27, 2009. Retrieved December 9, 2010. ^ Gumrukcu, Tuvan. "Turkey, Russia sign deal on supply of S-400 missiles". U.S. Retrieved 2018-06-28. ^ Editorial, Reuters. "Pompeo presses Turkey on S-400 missiles purchase from Russia". U.S. Retrieved 2018-06-28. ^ London, Lela (2018-02-28). "US THREATENS Turkey over surface-to-air S-400 MISSILE DEAL with Russia". Express.co.uk. Retrieved 2018-06-28. ^ "PressTV-Turkey rejects US sanctions threat over S-400 deal". Retrieved 2018-06-28. ^ "Iran's army to be equipped with S-400". PressTV. September 5, 2007. Retrieved December 10, 2010. Vice Chairman of Russia's State Duma Vladimir Zhirinovsky has urged the fast delivery of the magnificent S-400 anti-aircraft missile systems to Iran. ^ "Belarus asks Russia for S-400 SAM systems by 2010 – source". Retrieved 14 November 2014. ^ Defpro. Daily Saudi Arabia signs 2 billion dollar weapons deal with Russia Archived 4 September 2009 at the Wayback Machine, 1 Sep 2009. ^ upi.com Riyadh mulls big Russian missile buy, 22 March 2010. ^ "대한민국 방위산업의 미래를 지키는 기업 Hanwha Thales". samsungthales.com. ^ "Defense & Security Intelligence & Analysis". Jane's Information Group. Retrieved 2013-10-29. ^ "Doosan Corporation Mottrol : Defence Weapon". Doosan.com. Archived from the original on 2009-12-05. Retrieved 2013-10-29. ^ "True Dream Partner – LIG Nex1". Lignex1.com:8001. Archived from the original on 2011-07-13. Retrieved 2013-10-29. ^ "Russia in talks with Turkey and Egypt for the sale of the S-400". newsru.com. Retrieved 20 February 2017. ^ "Russia might sell S-400 systems to US if Americans feel insecure". ^ "Russia preparing to supply S-400 missile systems to India: Dmitry Rogozin". news. The Economic Times. 2017-06-02. Retrieved 2017-06-02. ^ Bedi, Rahul (1 October 2018). "India's CCS clears procurement of five S-400 air-defence missile systems". IHS Jane's 360. New Delhi. Archived from the original on 6 October 2018. Retrieved 6 October 2018. ^ Peri, Dinakar (5 October 2018). "India signs $5.43 billion S-400 missile deal with Russia". The Hindu. New Delhi. Archived from the original on 6 October 2018. Retrieved 6 October 2018. ^ "India inks $5.43 billion deal to buy S-400 Triumf missiles from Russia". Times of India. New Delhi. 5 October 2018. Archived from the original on 6 October 2018. Retrieved 6 October 2018. ^ Bedi, Rahul (3 January 2019). "India to begin inducting S-400 air-defence systems from October 2020". Jane's 360. New Delhi. Archived from the original on 3 January 2019. Retrieved 3 January 2019. ^ Rogoway, Tyler (26 February 2018). "Iraq Looking To Buy Russia's S-400 Air Defense System: Report". The Drive. Archived from the original on 27 February 2018. Retrieved 10 March 2018. ^ Binnie, Jeremy (1 March 2018). "Iraqi foreign minister confirms interest in S-400". London. Archived from the original on 1 March 2018. Retrieved 10 March 2018. ^ Ostroukh, Andrey; El Yaakoubi, Aziz; Jones, Gareth (25 January 2018). "Qatar in talks to buy Russia's S-400 systems: Tass". Reuters. Moscow. Archived from the original on 27 January 2018. Retrieved 27 January 2018. ^ Khan, Bilal (25 January 2018). "Qatar reportedly planning to procure S-400 SAM from Russia". Quwa Defence News & Analysis Group. Archived from the original on 27 January 2018. Retrieved 27 January 2018. ^ "Наука и техника: Западный военный округ получил дивизион комплексов С-400". Lenta.ru. Retrieved 2013-10-29. ^ Беларусь. "210-й зенитно-ракетный полк ВВС и ПВО России, дислоцированный около поселка Морозки Дмитровского района Московской области, получил на вооружение два дивизиона новейшей зенитно-ракетной системы С-400. / Союзное вече / Приложения / Народная газета". Ng.by. Archived from the original on 29 December 2011. Retrieved 29 October 2013. ^ "ВВС РФ в 2010 году должны получить еще пять дивизионов С-400 | РИА Новости". Ria.ru. 2009-11-26. Retrieved 2013-10-29. ^ "ВКС получили новый полковой комплекс ЗРС С-400". ria.ru. 3 November 2016. Retrieved 27 October 2017. ^ "МИНОБОРОНЫ РОССИИ ПОЛУЧИЛО ВТОРОЙ В ЭТОМ ГОДУ ПОЛК ЗРС С-400". ria.ru. 23 November 2017. Retrieved 27 October 2017. ^ "Третий за год полк зенитной ракетной системы С-400 "Триумф" передан Минобороны РФ - "Алмаз-Антей"". ria.ru. 26 October 2017. Retrieved 27 October 2017. ^ "В Подмосковье заступает на боевое дежурство второй полк ЗРС С-400 "Триумф"". vesti.ru. Retrieved 2015-12-03. ^ "Бойцы ПВО показали, как работает новый ЗРК С-400 "Триумф"". РИА Новости. Retrieved 2015-12-03. ^ "Еще пять дивизионов новейших систем ПВО С-400 могут поступить в ВВС в будущем году". Interfax.ru (in Russian). Retrieved 2015-12-03. ^ "BBC Russian - Россия - Минобороны: три полка С-400 защитят Москву к концу года". www.bbc.com (in Russian). Retrieved 2015-12-03. ^ "Оборону Москвы усилили четвертым полком С-400". ТВ Центр - Официальный сайт телекомпании (in Russian). Retrieved 2015-12-03. ^ a b c "Зенитчики ЮВО приняли на вооружение новую зенитную ракетную систему С-400 "Триумф" : Министерство обороны Российской Федерации". function.mil.ru. ^ "Первый комплекс С-400 развернут в Калининградской области". Российская газета. Retrieved 2015-12-03. ^ "Восточный военный округ получил зенитные комплексы С-400". lenta.ru. Retrieved 2015-12-03. ^ "В Находке заступил на боевое дежурство четвертый полк С-400 "Триумф"". www.arms-expo.ru. Retrieved 2015-12-03. ^ С-400 прибывает на Камчатку [The S-400 arrives at Kamchatka] (in Russian). livejournal.com. Archived from the original on 27 April 2015. ^ "Источник: Минобороны РФ в декабре впервые получит С-400 трехдивизионного состава". ТАСС. Retrieved 2015-12-03. ^ "Зенитно-ракетный полк ЮВО ВВС России получил на вооружение комплекс С-400 "Триумф" – Телеканал "Звезда"". Tvzvezda.ru. 2011-01-02. Retrieved 2013-10-29. ^ "Первый полк С-400 заступил на боевое дежурство в Мурманской области" [The first Regiment with the S-400 entered active military duty in the Murmansk region]. NTV.ru (in Russian). 21 March 2015. Retrieved 26 November 2015. ^ ""Триумф" на Кольском полуострове защитит РФ от самолетов-разведчиков". Российская газета. Retrieved 2015-12-03. ^ a b "Новосибирская противовоздушная оборона начала перевооружение на ЗРК С-400 "Триумф"" [Novosibirsk air defense began retooling on the s-400 "triumph"]. RT (in Russian). 6 October 2015. Retrieved 26 November 2015. ^ a b "Новые С-400 прибыли на место дислокации в Саратовскую область". 22 December 2017. ^ "Военные во Владивостоке начали осваивать С-400 "Триумф"". РИА Новости. Retrieved 2015-12-03. ^ "Kazakhstan to get first S-400 air defense systems after 2015". En.tengrinews.kz. 2013-03-15. Retrieved 2013-10-29. ^ "Россия поставила Белоруссии две зенитных ракетных системы С-400". 28 June 2016. ^ "Russia begins delivery of S-400 air defense missile systems to China – report". ^ Devitt, Polina; Osborn, Andrew (18 January 2018). "Russia starts shipping S-400 air defense missile system to China: TASS cites source". Reuters. Moscow. Archived from the original on 19 January 2018. Retrieved 19 January 2018. ^ Dominguez, Gabriel (18 January 2018). "Russia begins delivering S-400 air defence systems to China, says report". IHS Jane's 360. London. Archived from the original on 19 January 2018. Retrieved 19 January 2018. ^ "Algeria might have begun deploying new Russian SAM systems - Defence Blog". defence-blog.com. ^ ARG. "S-400 Triumph (SA-21 Growler) Air Defense Missile System - Military-Today.com". www.military-today.com. ^ "Russia confirms sale of S-400 missile systems to Saudi Arabia — RT Business News". Rt.com. Retrieved 2018-08-22. ^ "Саудовская Аравия купит у России комплексы С-400 и тяжелые огнеметы". 9 October 2017. ^ Editorial, Reuters. "Turkey says Russian S-400 missile delivery brought forward to July…". Wikimedia Commons has media related to S-400 Triumf. English: Radar S-400 (basic and potential as Protivnik-GE, Gamma-DE) their exact specifications and photos, indicated target size, height and distance, resistance to interference and anti-stealth capabilities, time to deployment, and other details. S-400's 92N2 radar and 5P85T2. The 48N6E3 missile used by the S-400. 22T6 loader-launcher from S-400 and S-300 systems. 5P85SM2-01 TEL launcher from the S-400 system. ТЗМ 22Т6 on the Ashuluk proving ground in 2017. S-400 at the 2013 Moscow Victory Day Parade. S-400 surface-to-air missile systems during the Victory parade 2010. An S-400's 5P85SM2-01 missile launcher mounted on a MAZ-543M chassis. S-400 system during a rehearsal for Russia's 2009 Victory Day parade in Moscow. Russian 15.00 rubles stamp commemorating the 150th anniversary of the Obukhov State Plant. 9M83ME and 9M82ME SAM for S-300VM Antey-2500 missile system and 48N6E3 SAM for S-400 system. The self-propelled launch vehicle 5P90S on a BAZ-6909-022 chassis for the S-400 system. The all-altitude detection radar 96L6E of S-300/400 systems, mounted on the chassis of MZKT-7930. The BAZ-69092-021 towing vehicle for the 5I57A power generator and the 63T6A power converter for the S-400 system. 76N6 Clam Shell FMCW acquisition radar is used to support the Flap Lid SA-10 fire control radar. NATO code name: "Clam Shell." Two 5P85SM surface-to-air missile launchers and a 92Н6 radar guidance at Russia's Khmeimim airbase in Syria. All-weather acquisition radar 96L6 pictured in the far right in the background at Russia's Khmeimim airbase in Syria. Members of Commander, U.S. Naval Forces Europe Band prepare to perform during the 2010 Victory Day Parade. Two S-400 SAMS are driving in front of the band. This page was last edited on 18 April 2019, at 19:08 (UTC).